Chennai Super Kings (CSK) captain MS Dhoni and wife Sakshi made good use of the free time ahead of team’s flight to Jaipur. Dhoni and Sakshi were seen taking a nap on the floor of Chennai airport. The CSK skipper took to Instagram and posted the picture along with a caption which read, “After getting used to IPL timing this is what happens if u have a morning flight.” Empty Seats at MA Chidambaram Stadium Could Force IPL 2019 Final Out of Chennai. On Tuesday, CSK hosted Kolkata Knight Riders (KKR) at home. The match started at 8 PM IST and ended at around 11:30. However, owing to post-match formalities the players would have left the ground late. With just one day gap, CSK will next face Rajasthan Royals at Sawai Mansingh Stadium in Jaipur. And thus the team had to catch an early flight to the Pink City. 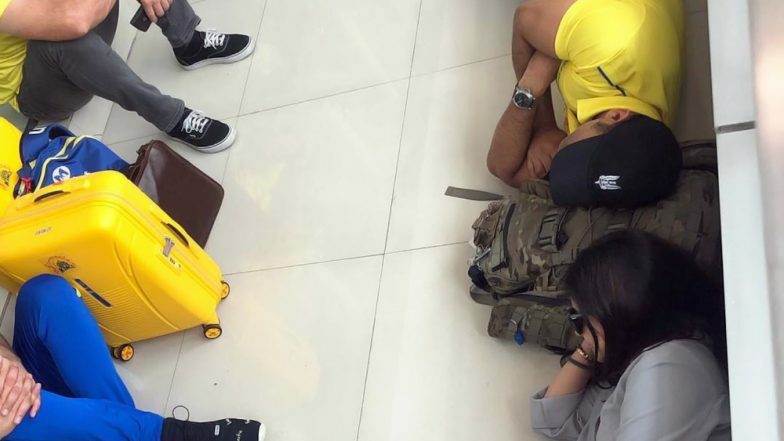 The players, especially Dhoni and his wife, appears to have not got proper sleep and thus decided to take a nap on the airport floor. IPL 2019 has a tight schedule and there is no rest day till the first round games get over. CSK's Deepak Chahar Creates The Record For Bowling Most Dot Balls in Indian Premier League History. Following the match against Royals, CSK will have a two-day gap before their game at the Eden Gardens against Kolkata Knight Riders (KKR). Meanwhile, the home game win over Knight Riders helped Super Kings climb up to numero uno spot on the IPL 2019 points table once again. CSK vs KKR, Stat Highlights: Chennai Super Kings’ Bowlers Help Them Beat Kolkata Knight Riders by Seven Wickets.